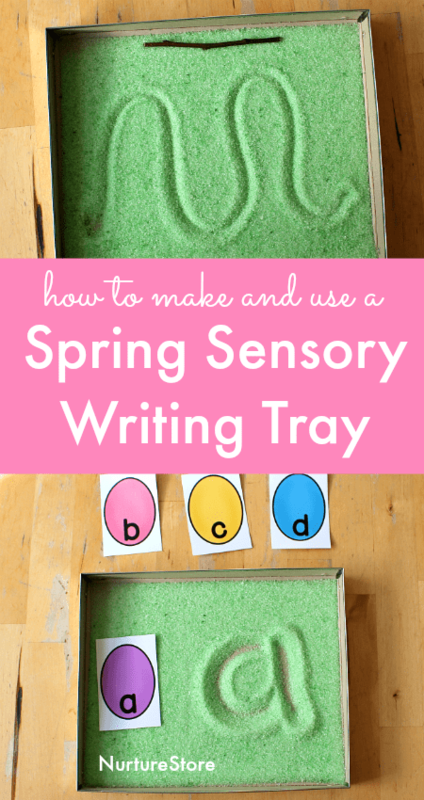 Use this DIY spring sensory writing tray and literacy ideas to give your spring writing centers a fun, hands-on twist. A writing tray is a clever bit of kit to add to your learning. It’s good for very young children who are just learning about making marks all the way through to older children who are working on spelling. The great advantage of using a writing tray is that it brings a multi sensory element to writing. Using a multi-sensory approach to learning means you can suit any child’s learning style: whether they are particularly in tune with moving, feeling, seeing, smelling, doing… Children get a deeper understanding as they are coming to the learning through many different ways. Plus it also makes the learning fun, which always makes you remember things more. :: Find a container to be your tray. 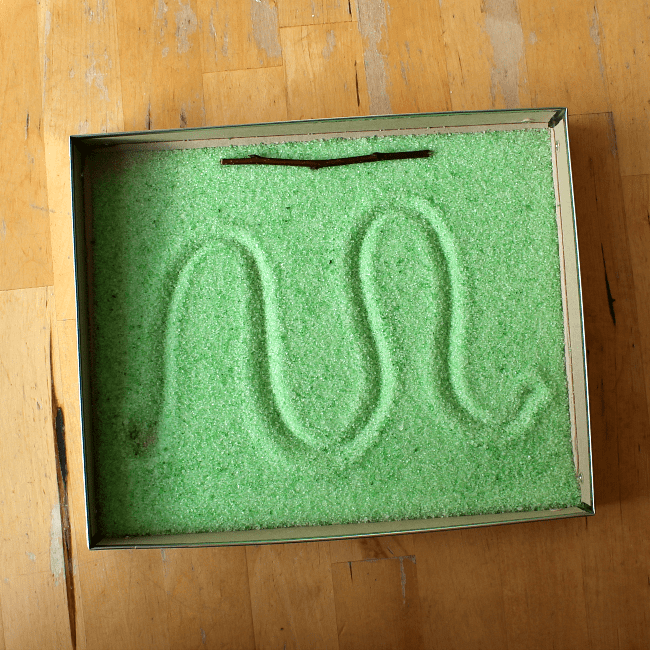 It needs to be shallow, so your children can easily write in it without having any trouble leaning their hand inside, and big enough to write a word. A kitchen tray, a baking tray with shallow sides, the lid off a storage box, a cardboard box with the sides cut down are all good options. :: Fill your container with your choice of material: sand, salt, sugar all work. You can add colour to salt and sugar by placing your material in a plastic bag and adding paint or food colouring gel. Give it a good shake and mix to spread the colour through the salt/sugar. Spread it out on your tray and leave it to dry over night. To colour sand I grate in some chalk and mix it in. You can use herbs, spices or essential oil to add some fragrance. Green colouring with some fresh copped herbs would be a nice spring themed writing tray. You only need a shallow layer of your material – if you make it too thick it’s hard to see the marks and letters you make. :: Then you can use your finger, a pencil, or a twig to make marks and write in your tray. :: They can learn to write their own name. :: Older children can use the tray as a multi-sensory and fun alternative to pencil and paper to practise spelling. :: You can bring a twig back from one of your nature walks to use as your ‘pen’. Or use a carrot! 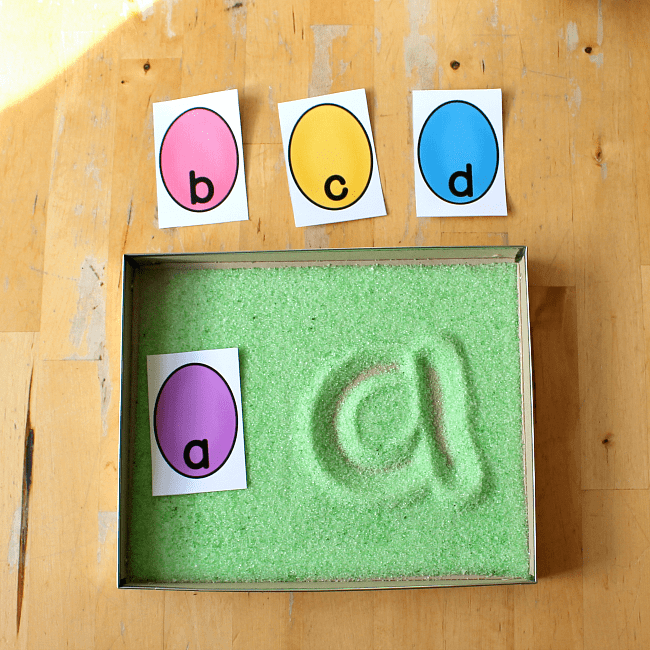 :: You can use my egg alphabet printable alongside your writing tray to make letters and words to copy. :: You can use my carrot number cards printable to practise writing numbers. They’re combining four senses to help them learn the word/letter. 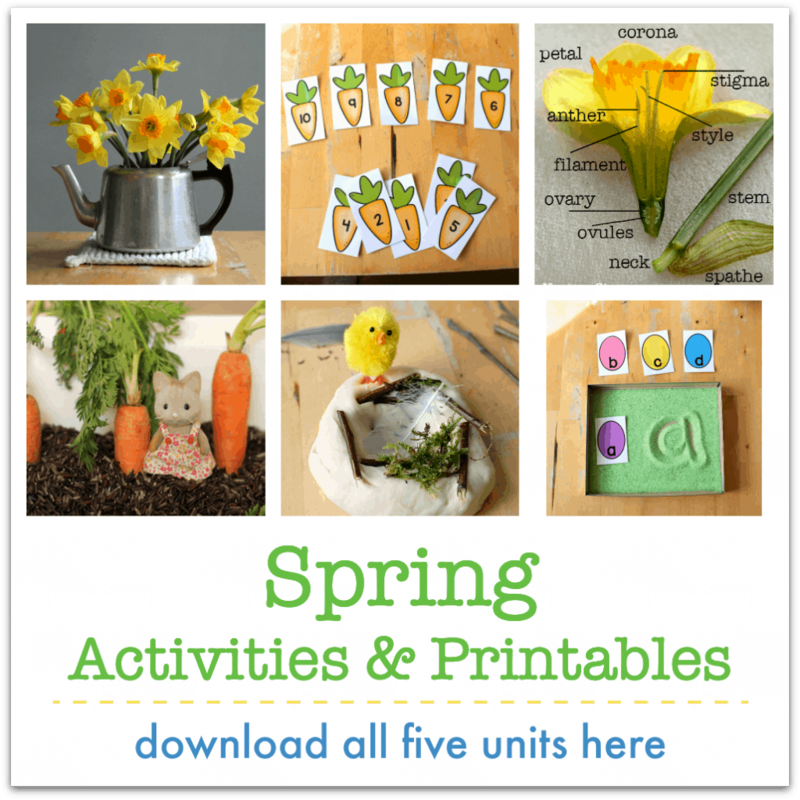 Try writing the word/letter a few times, then turn the egg printables over and see if you can write it in the sand/salt without seeing the word.